Scandinavian Marine & Offshore Service (SMOS S.A. de C.V.) is an established statutory service company at Talleres Navales Del Golfo Shipyard in Veracruz, Mexico. We perform annual inspections of Cranes and Lifeboats at our authorized workshop and bring a wide range of services to the busy port of Veracruz. All makes and models on board vessels – for any flag state! The maritime industry is regulated by international laws, standards and guidelines to ensure the quality of the work performed and especially the safety on board. We are sure to comply with all applicable laws and meet all flag states’ and classification societies’ requirements. 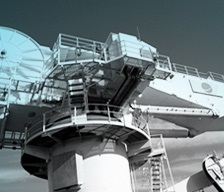 Scandinavian Marine & Offshore Service is the joined forces of Hytek A/S and Reinmex S.A de C.V. and together we put our best competences to work. Our customers benefit from our many years of experience, specialist know-how and worldwide service network.